It is my last half day - I shall have to get back to London to catch my flight to SFO tomorrow morning. I have a couple of things to do before I go, however. 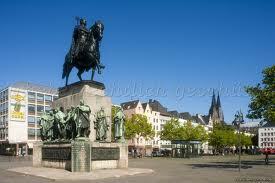 I grab breakfast at Hotel Domstern, and then go out to take a couple of exterior shots at the Dom. 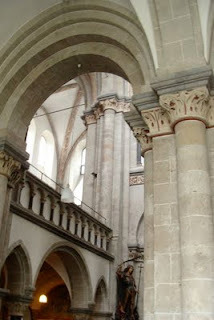 My real intent is to find my way over to Antoninkirche so that I can see the Barlach Engel. 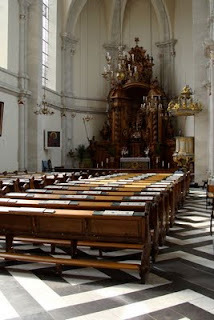 On the way, I stop at Kolumba, one last time for a couple of photographs, and a moment in the chapel, and then make my way over to the other church. As I approach it, I get a very bad feeling. It is Evangelisch, and likely to be locked. I am right. The doors are locked tighter than a drum - I try each one but to no avail. I read every bulletin and announcement, and it looks like Sundays only. In the courtyard a gentleman is closing the door. I ask him when the Church is open, "Nur am Samstag" is the reply. I tell him that I had hoped to see the angel (hoping he would let me in for just a couple of minutes. "Nein, es tut mir leid" (No, I'm sorry) "Schade" (Too bad), I reply, and he says "Bitteschön!" (You're welcome!). 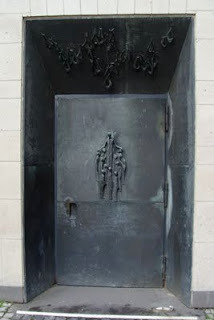 Every Lutheran Church that I have seen in Köln has been closed, and uninviting. Every Catholic Church has been open and quite welcoming. I should talk, my own church is closed, except for mid-day Mass during the week. This will make me think a bit. It appears that the Evangelical Church has a huge restaurant - information center that surrounds the church on two sides. Coffee? Yes! Art and Prayer? No? I am disappointed. So I wander away, hoping that something else will come up. And indeed it does, as I wander away from the closed church, I see a familiar profile up ahead. It is Apostelnkloister, a Romanesque Church of great beauty. It is open, and once inside, a gentleman comes up to me and allows me to wander and take photos. 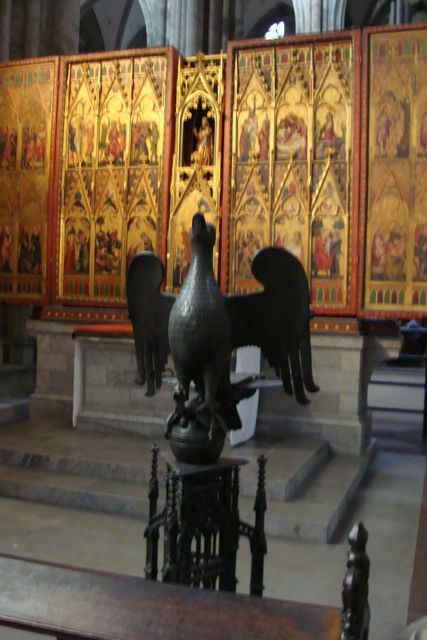 There is a remarkable hanging pyx above the altar. I have read and seen photos of such things, and always wanted to see one in use. A pyx is a vessel for holding the consecrated host (the box being held in the claws of the dove). 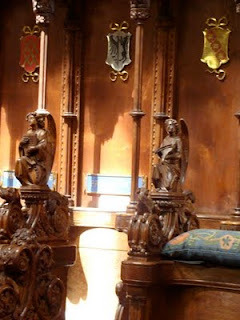 It is quite beautiful, along with the other furnishings. Heavily bombed in the IInd World War, it is heavily rebuilt with new windows, some doors, and vault and ceiling frescoes. God has given me something else other than the Engel, and I am grateful. I've been walking too much, so I find a place for a macchiato and two thumbprint cookies, made with marzipan, however. I sit and relax and watch the world walk by. There are (and have been) lots of men walking their dogs - eye candy. I wander around looking for a Süßwarenladen where I might find some marzipan fruits for Mom. None are to be found. I am going to have to rely on the store at the Hbf, or at the Flughafen. I am on a mission, however. I want to go back to Egino Weinhert's studio and store next to the Erzbischofsvikariat, near the train station. He is the artist that is responsible for a great deal of the metal work that I have been seeing. In the studio it is all lying around, like so much hardware - but such beautiful hardware. Yesterday I saw an aspergillum that was afordable and a good example of the metal work of which I have been bragging in these posts. Now it is mine, my souvenir of a wonderful trip to Köln. I go back to the hotel and prepare to check out. It is an ugly day in Köln, with thunder and lightening. I really enjoyed the Hotel Domstern - the hosts are really quite nice. I lug my stuff to the Hbf, buy a ticket (getting here it was €8,60, and the return was only €2,50). I get there quickly and with no hassles - why can't we do this in America? There lunch and then waiting for Passport Control to get there, and finally we board. Once again the Channel is covered over by clouds, but as we approach the mouth of the Thames, it clears off. We streak over Eton and Windsor, and I crash at a Holiday Inn. It was just a few days - but it was utterly refreshing. I have an irregular sleeping pattern last night - very odd. So I wonder if I will be tired today. I have breakfast and the English and the Canadians are still there. We talk about income taxes. 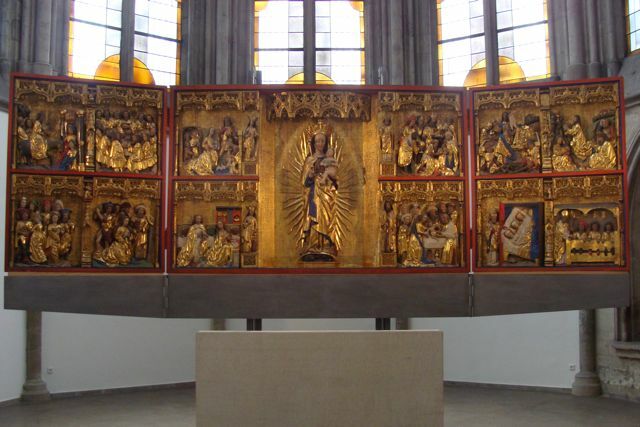 My goal today is to see Kolumba, the Archepiscopal Museum at Köln. Arthur raved about it when he went to see it a couple of years ago, so now I want to see it to. I will approach it gradually. The deskman at the hotels warns me about possible rain, so I go to the Hbf and buy an umbrella, and a large tote, and then start out in the direction of the Kolumba. On the way, however, I stop in at Minoritenkirche. It is a beautiful church, a product of rebuilding after the war in which modern elements are posed against older pieces that survived. Here, again, there is wonderful metal work - the lectern, candle stands, gates at the confessionals, and door hardware are all remarkable. The windows, however, are not to my taste. 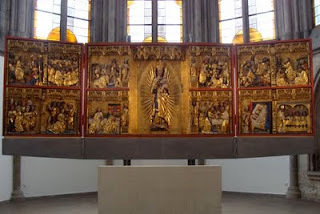 There is a beautiful gilded altarpiece mounted where the high altar once stood. A man has followed me as I entered. He explains auf Deutsch, some of the themes and pieces. I thought he was going to chide me for taking photographs, but rather he invites me into the chancel to take more! It is a delight to freely move around the room to capture some of the delights. I think he liked it that I honored the Sacrament, and signed myself with holy water upon entering. 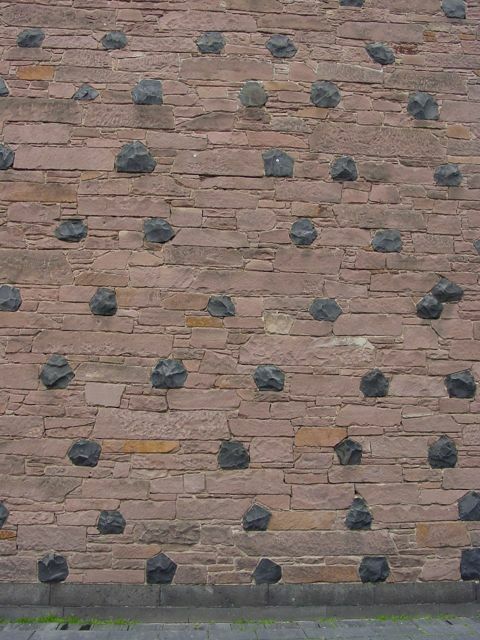 Kolumbakirche is but a block away, but I come at it from the other side, and as I look at a surviving wall, I recognize the same stone pattern as at Düren and at Marienplatz. As I walk around the remains of the church (which is surmounted by a huge modern buiilding) I notice that the church is actually still there. There will be more surprises later. The Kolumba doesn't open until 12:00, however, so I shall have to wait. I walk down the street to kool my heels and glance at my watch - 10:00. I stop at a Café to have a Macchiato and some apple cake. When that is finished, I realize that I have some time to kill and set out toward the North. This part of Köln is what I heard some English people complaining about - modern buildings with little character, lower grade retail, and very little in the way of public amenities. True indeed, and lots of traffic as well. There are surprises, however, just waiting for the patient. In the distance I see a belfry with a glockenspiel inside - soon it chimes out as my attention is drawn to a portal that is standing in the midst of a sidewalk approaching the church with the belfry. 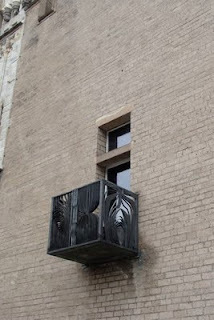 I appears that this is the only part of a Jugendstil house that stood on Apfelstaße before the war. 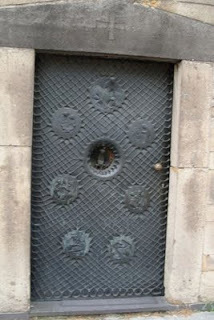 A plaque explains the house and its owners and the symbolism of the portals. It is quite lovely, and I wonder what the house was like. 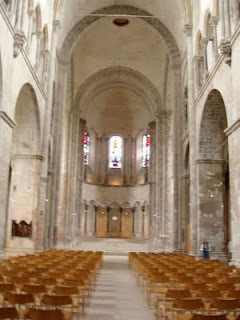 The church Notre Dame du Mont, is a Marian shrine. 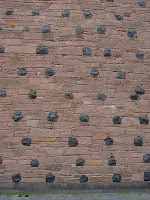 A plain brick exterior hides an elaborate Baroque interior. The wood, however, is not gilded or painted, but left natural. One can only peer in, as the gates are kept locked. So I shoot some photos through the grill of the gates, and then sit and meditate at a shrine of the Black Madonna that sits at the entrance to the church. Lots of people come and go, lighting candles and muttering prayers. A young woman and her little girl come and go as well. There seems to be an active piety here. I continue further north, and notice a building that piques my interest. It turns out to be El De Haus, a former jewelry business that was rented by the Gestapo and turned into a Nazi Documentation Center. 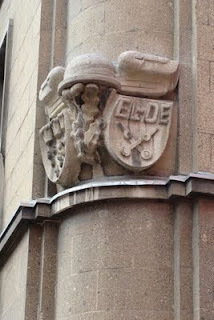 The "El De" stands for the initials of the jeweler who built the building. Inside there is a great deal of documentation, original propaganda posters, pamphlets, kinoscopes, personal letters, etc. It is moving and disturbing all at the same time, doing what the Memorial to the Murdered Jews of Europe does, but with less technology and a much broader mandate. Downstairs there are cells where detained types were held: conscientious objectors, Roma, Jews, homosexuals, communists and others. The graffiti of the cells attests to the human presence there, and the under basement is evidence of the executions that took place there. It is not crowded, but neither is it quiet. Those who are there are dealing with a past that may have alluded them. Kolumbakirche is a marvel. It "floats" in the midst of the ruins of its former self, revealing four or five other churches that have stood on this sight. The chapel is small, with a circular chancel where the altar is surrounded by stained glass angels. 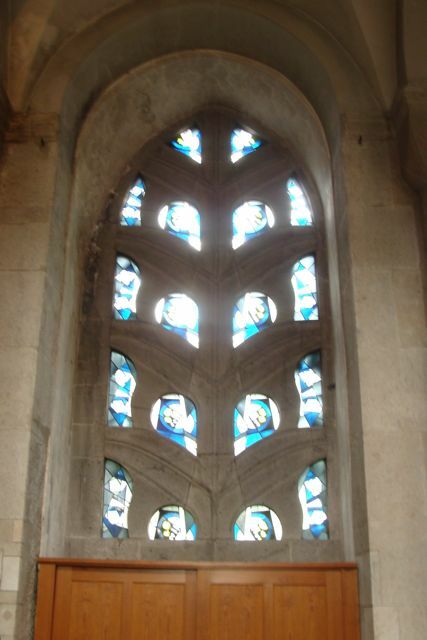 At the western end is an elegant and modern window depicting St. Catherine. 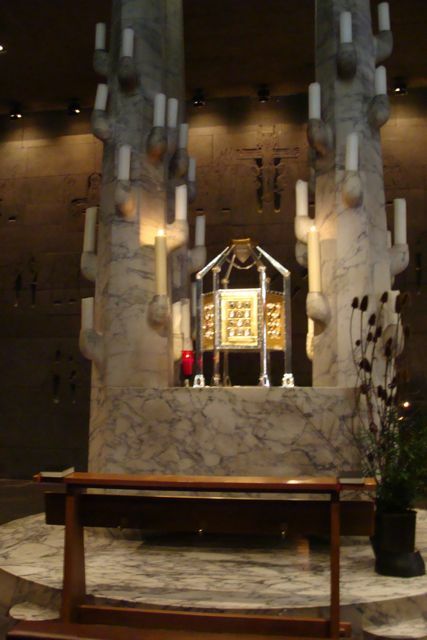 Next to this chapel is a sacramental area with an old baptismal font, and an exquisite modern tabernacle, all gold and jewels. I pause there for a moment to take it all in. Behind the Sacramenthaus and incised into the wall are the Stations of the Cross. I take some photographs and then steal away to the museum. Unfortunately I locked up my camera with my tote at the insistence of the museum sentry (although others were taking photos). Perhaps it was a good thing - I just looked and took it all in, from the walkway over the ruins, to the juxtaposition of ancient reliquaries, vessels, and processional crosses to Jena teapots, Stella steel, and the art of school children. Marvelous! It's time for lunch, and my back is killing me. I grab a quick bowl of potato soup with mushrooms. It's good, but the service at the restaurant is horribly bad, being run by late teens who have no sense of responsibility or service. I have wanted to see the other church that faces the Hbf, but on the north. 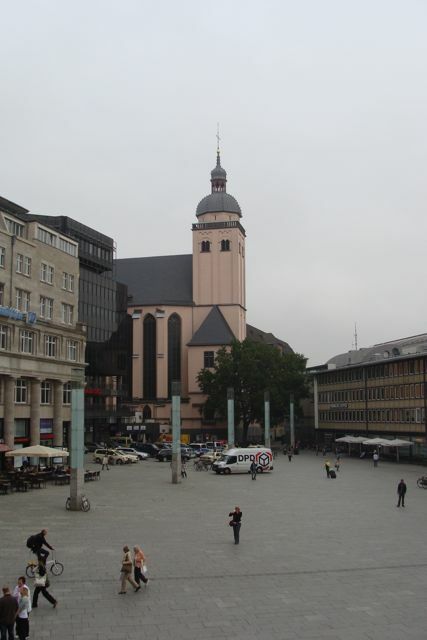 It is Sanktmaria Himmelfahrtkirche, and it is also the complex from which the Erzbischof runs his archdiocese. The church is gated, so the photos are restricted to what you can get from poking your camera through the grill. 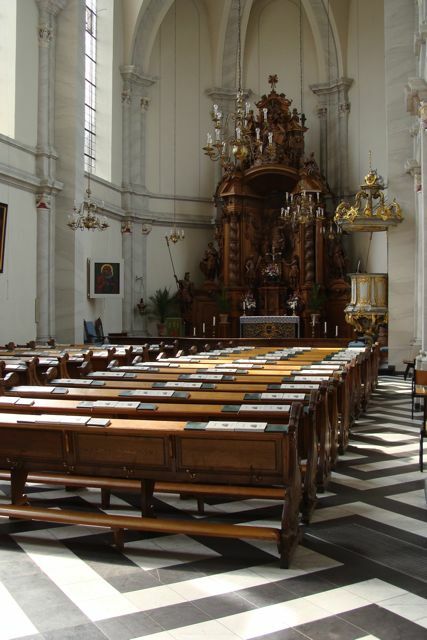 It is a high baroque sanctuary situated in a late gothic building. 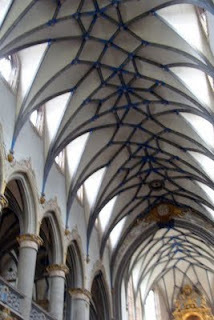 The ceiling is a wonder, an aspect of German churches that I have always liked. All is gilt and putti. 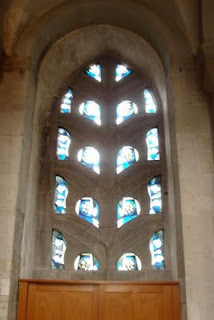 The windows are modern, clear glass with a complicated modern leading that is difficult to photograph. Down the street and next to the offices of the Archdiocese, is the studio of the man who is responsible (I think) for a great deal of the metal work in the city. I am allowed in and look at all the beautiful things that he is created. I will go back tomorrow to see more. I go back to the hotel, first attempting to get into St. Ursula's, but to no avail. My back is hurting, so I rest a bit. I hit the cathedral one more time taking a few more photos - this time with the correct setting. The crypt with the tombs of the Archbishops is especially interesting with more of the metal work that I saw at Minoriten. 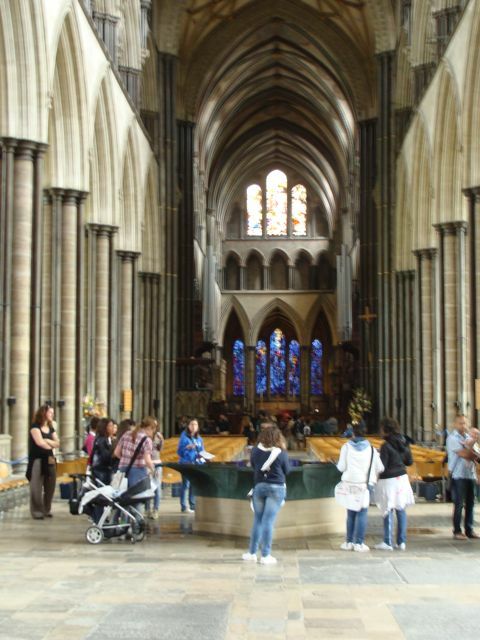 The cathedral is jammed because it is raining outside, and people are staying in. 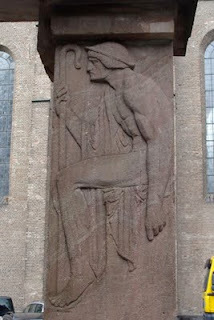 I go over to the cathedral bookstore, and then to the bookstore next to the German-Roman museum. 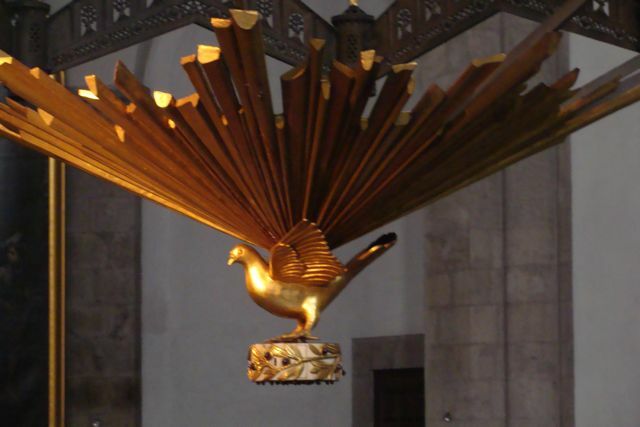 It is in the latter that I discover that the Barlach Engel is here in Cologne, hanging at St. Anthony's Church. That will be tomorrow's adventure. I have suppers (Goulash, Salad, and Vanilla Eis mit Rotegrütze - all excellent at a boisterous and sehr Gemutlich Gaffen am Dom. A quick run, then, through the rain, and home. I sleep in a bit, but am at breakfast by 9. It's a typical German hotel breakfast, except that here, all there breads are hausgemacht, and so good. So I have slice of bread packed with whole grains and nuts along with a little sausage and cheese. Very good. There are two young women from Canada there along with a couple from England. When I come back into the room they are commenting on "how unfriendly" Americans are. I object, and they ask me where I am from. "San Francisco." "Oh," they reply, "it's only the people on the East Coast who are rude and unfriendly." I am at a loss for words. When I tell the English couple that I've just come from Salisbury, they are delighted. 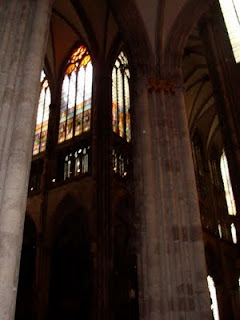 "This one (the Kölnischer Dom) is just too dark. I don't like it" says the English woman. Again, I am at a loss for words. 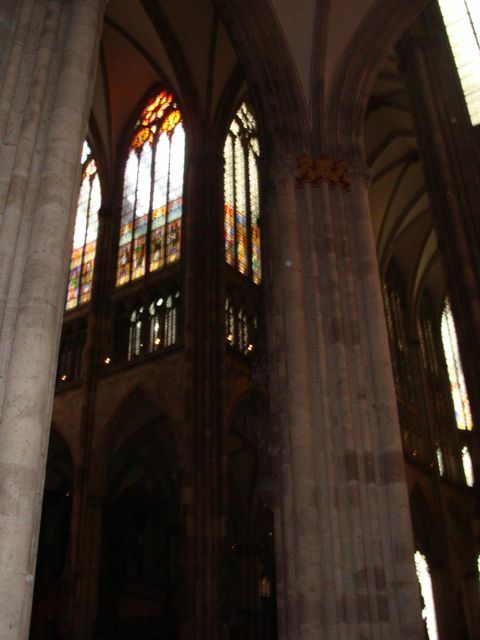 It's difficult to take in the Dom. And I must admit, I shall need to warm up to it. Perhaps it is the swarms of people, or all the construction (restoration) that is going on. I just don't seem to be able to settle in and engage this building. I decide to go to the Schatzkammer and there find a great deal of delight, not only in seeing holy things, but also the ancient cellars that they have used, and the fine materials they have used in giving the tourist access. I am especially appreciative that they have included modern pieces (crosiers, pectoral crosses, vestments, and eucharistic vessels) in their display. The modern pieces are quite nice. I walk across the south plaza and look back. It is truly an amazing collection of stones. I sit at a small cafe and have a Coke Light. I need a pause. I catch the profile of the Rathaus in the distance and make off for that, but am detoured by Groß Sankt Martinus. Here in this wonderful Romanesque church are all the aspects of modern architecture that the Germans applied to ancient buildings as they rebuilt them after the War. The clean space highlights the architectural mass. I am quite taken. (Although not everyone reacts to the space in the same way that I am. An English family lets their young son - say 5 years or so - scream and yell, and jump up an the altar. Not good.) I drink it all in as a realization begins to develop in my mind. I walk around the building trying to get a sense of its mass. There is no one good aspect to this building, except, I guess, from the air. I move on, crossing Heumarkt, noticing two towers that seem interesting. To get to the one, I need to walk around a huge subway construction project, and when I get to the tower, realize that the church is gone. 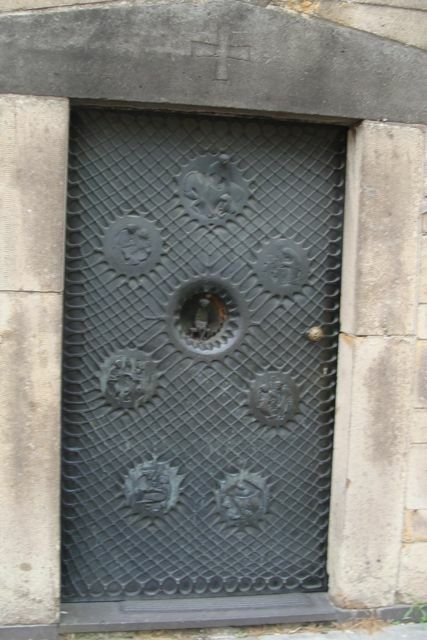 Only the tower, and a door from a restoration after the war remains. 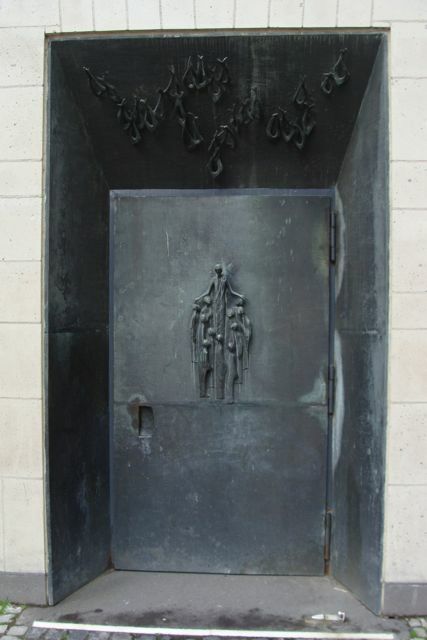 The door is marvelous - chased bronze with seven medallions, and a central image of the suffering Christ. As I walk away, I realize that what remains is now a night club. Sad. But I need to get on to the next tower. It means navigating this subway project, which in its own way is just as fascinating. There is a complexity to what they are doing down there that just boggles my mind. 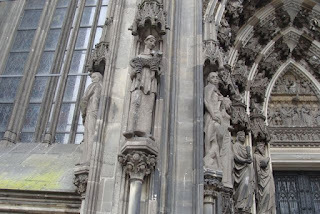 I am making my way to Sankt Maria im Kapitol, and come upon it from the real. 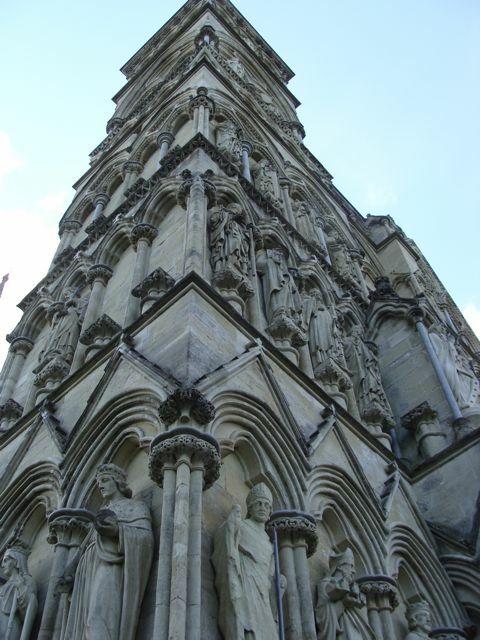 There is a delightful gothic entrance to the yard around the church, with figures in niches on the interior side. There are architects walking around making comments about the building. It is fun to listen in. However, I make my own little discovery before going into the church. 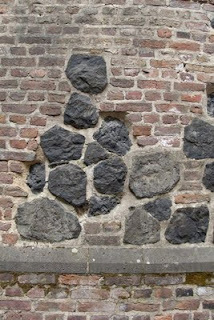 The retaining wall next to the gothic gate displays a combination of dark stone with a lighter material, a pattern that I have seen before. 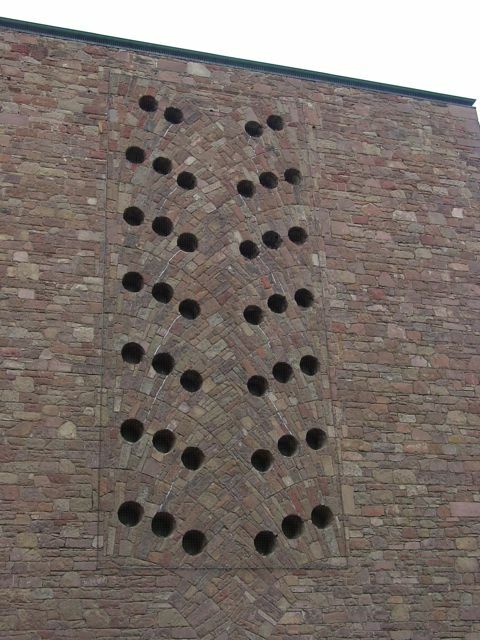 At Rudolf Schwartz's Sankt Anna Pilgerkirche in Düren (I think I may have to train over there before I leave) there is a similar combination of dark stone with light stone used in his tower for the church, built in the 1960s. I will find another reference when I enter the church. The church entrance is finally found and one enters through a restored cloister. 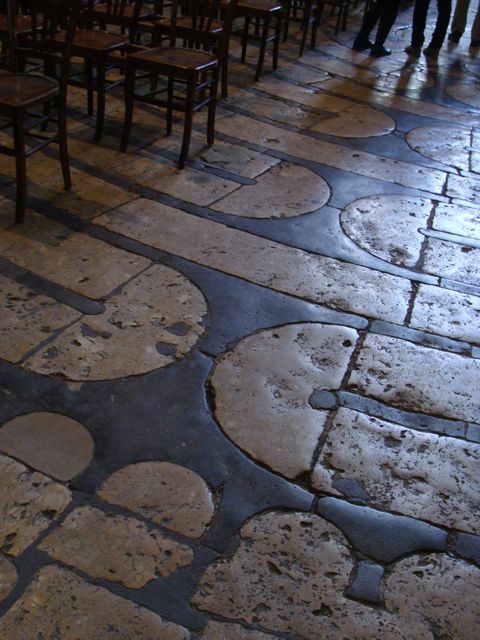 The plan is a nave with three apses acting as a sort of cloverleaf attached to the nave. 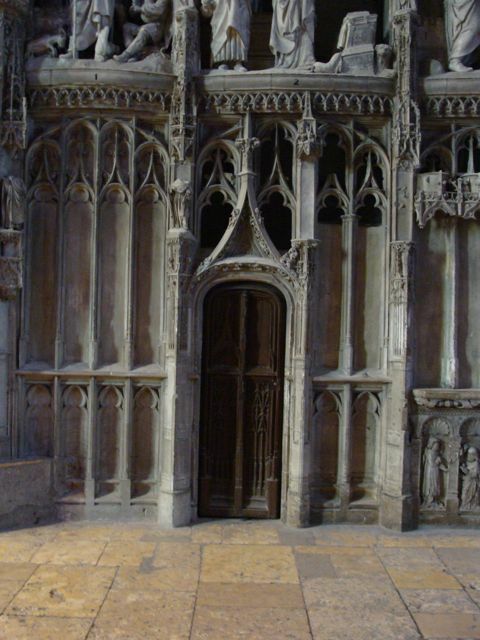 The altar is at the crossing and the eastern apse is divided at the crossing by a "bridge", somewhat like a rood screen, but surmounted by a lovely organ rather than an inhabited cross. 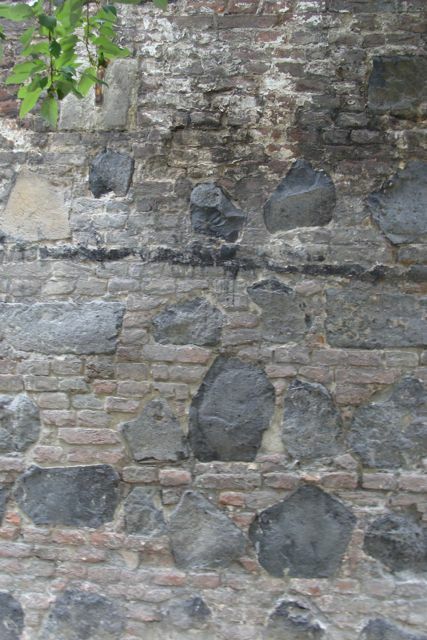 The building was heavily damaged during the war, and one can see the restorations. I think that Rudolf Schwartz may have been involved in the reconstruction here as well. 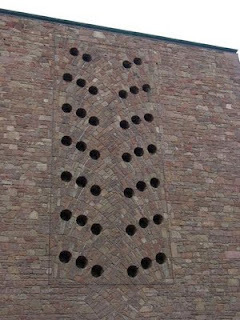 There are a series of windows that are reminiscent of his chancel stonework in Düren. 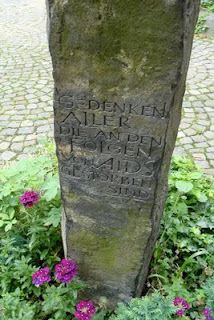 On my way out, next to the gothic gateway I mentioned earlier, I find a plinth of stone with a poem engraved on it. 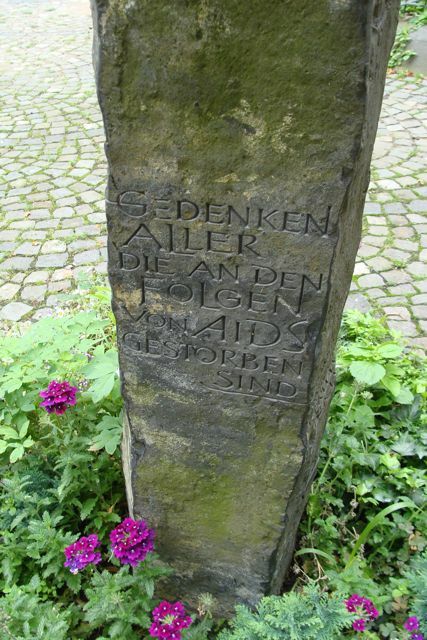 Upon closer inspection I see that it is a memorial to all who had died from AIDS. I am moved, as a pause, and then make my way back to the world that is now. By now I am hungry and make my way back to Heumarkt and sit down at an Italian place on the square, but decide that I shouldn't eat Italian food when I am in Germany. So it's over to another place with a nice Schnitzle mit Waldpiltzenrahm. I wonder when its a piltzen or a pfifferlinge? I shall have to find out. From there I wend my way to the Rathaus, and on the way come across a huge archeological excavation where the new Jewish Musem is going to be built and where they have uncovered both medieval and Roman ruins. 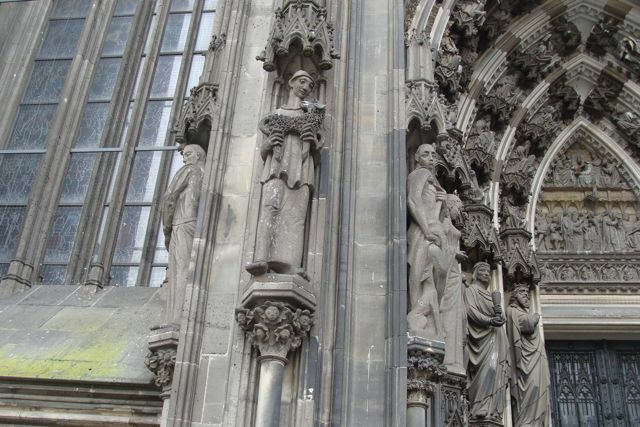 At the Rathaus I am especially interested in an Italianate portico built by Wilhelm I, with a rather presumptuous inscription bounded by rondels with the profile of the Emperor Constantine. It seems that the Holy Roman Empire wasn't quite dead - at least not in his mind. This portico is attached to a gothic building which is connected to the gothic tower by a small modern extension with a wonderful balcony. And here I will say it. 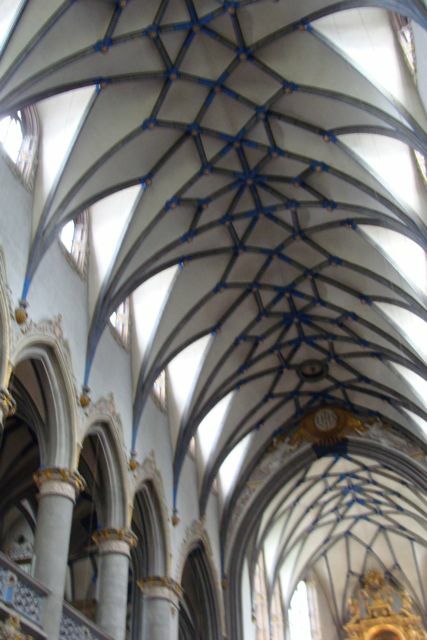 I am really quite partial to German architecture, especially their ecclesiastical and civic architecture. They seem fearless in joining new to old. The metalwork is especially fine, and can be seen everywhere, made useful and attractive in very ordinary situations. 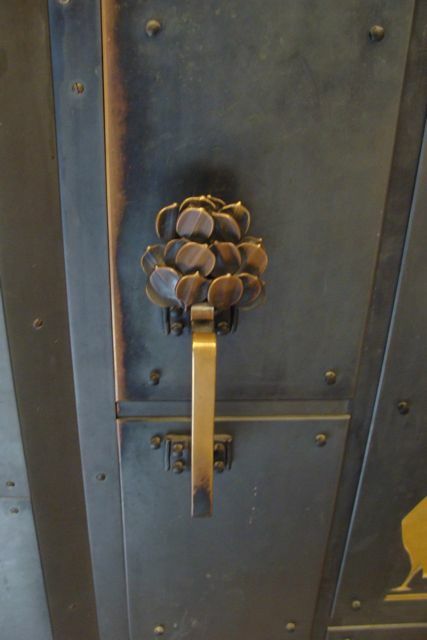 Door knobs, emergency push bars, fire doors, ordinary doors. It's all quite appealing. There's not much post modernism here. I take some time at the Roman-German museum, but perhaps I have seen too much. MEGO - "my eyes glaze over" as my sisters would say. I walk through the museum, and there is an interesting exhibit on the gardens at Amarna during the reign of Akhetaton. There are artifacts, and they have reconstructed some of the floral necklaces and pectorals that were used at funerals. There are also large models of the gardens themselves along with associated buildings. Enjoyable. Also enjoyable were the mosaics that had been recovered in the 19th and 20th centuries. I need something sweet. At an outdoor restaurant I have Vanilla Eis mit heißen Kirschen. Delicious. I head north by the front of the Dom, looking for my final (for today) Romanesque church - Sankt Andreas. 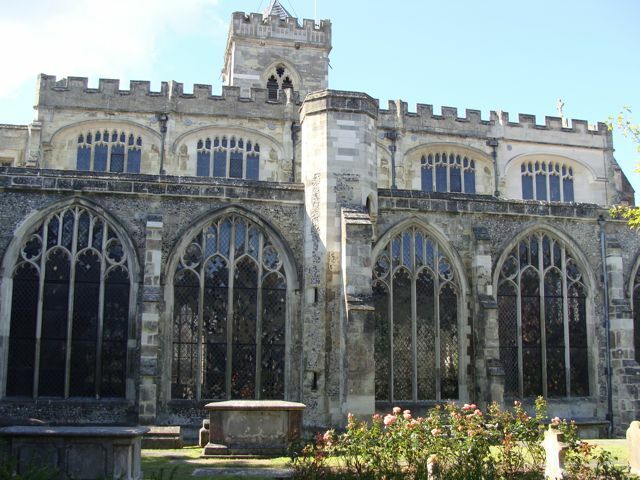 It's difficult to get a feel for the exterior since it is bound in on three sides by its cloister, and on another by a huge bank building. It is a marvelous building. It is a traditional cruciform building, with the altar at the crossing, and behind it a choir for the monks (Dominican). The windows are all new and quite stunning. Down in the crypt are the remains of Albertus Magnus, the great Doctor of the Church and the hopeful reconciler of Science and Religion. I am, by now, quite tired. It's time for the hotel. I get up early to pack, and then go out to find some breakfast. I am hoping that the pastry shop off the Market Square will be open because I was eyeing their many pasties the other day, and wanted to have one before I left. I am in luck, they are open, but with out seating. So I buy a wonderful Steak and Mushroom Pie, and a black current juice and go sit on a park bench. 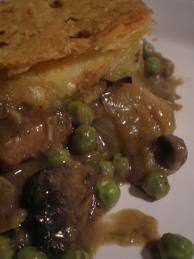 The pie is really good - lots of meat and mushrooms with a rich gravy - I'm a fan. I walk around a bit considering an encore but decide against it. I check out, and they hail a cab for me. He whisks me off to the train station, and we talk about his holidays (Sierra Leone and Wales). Fascinating. This taxi driver has a more interesting life than most people - and socially responsible as well. I'm impressed. The train ride into London Waterloo is unremarkable, although there is an interesting woman who runs the concession cart. She was there on the trip out, and here she is again (ginger ale and peanuts?) it must be what she does. Again, the lands through which the track runs is a vibrant green (with the exception of a huge hog farm somewhere outside of Salisbury). It is all remarkable clean and well kept. As we make our way into London, I am fascinated with the skyline that is developing. The "gerkin" is now surrounded by a "lipstick tube" an emerging glass pyramid, and other buildings all piled up on either side of the Thames right near the Tower. I am reminded of La Defence in Paris, with its jumble of modern buildings. I wonder how they will fare in time. The British buildings just seem silly to me. They grab attention, but for how long? They quickly move past as we make our way into Waterloo station, and soon we are back into a Victorian-industrial esthetic. I grab my bags and make my way down to the Bakerloo line, and go up to Paddington - it's rather quick today, and then onto an Express out to Heathrow. I've made the day longer by doing this. I could have taken the train from Salisbury to Woking, and then trained to Heathrow from there. Next time, I shall know. 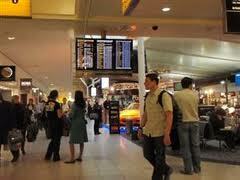 I've had good and bad moments at Heathrow - what will today bring? Students! Most of them are German (natürlich since I am checking in at Lufthansa) and in their early teens. They are in a massive group, and each has to check in individually. Bad for me - good education for them. So it takes some time. Then one is ushered into a world of "Duty Free". I resist, only wanting to have a bit of lunch and a gate number. Heathrow has the policy of witholding the gate number until "approximately 30 or 40 minutes prior to departure". I have lunch at a place, hoping to replicate the morning pie, but no luck. I have their version of a Cornish pastie, but it is not nearly as good. There is a nice fruit salad as well, with a minimum of mellon. Now I go and wait for a gate designation. And I wait, and I wait. At the last minute the gate is announced (15 minutes before take off) and the gate announced is 15 minutes away. Dash. What I am looking forward to is flying over the Channel and seeing it from the air. 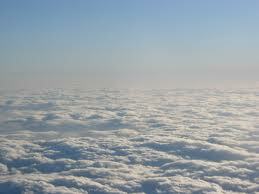 I am wrong, for all that I can see are clouds. So I glance at a Die Welt article on Amy Winehouse, and there is a snack - a sort of apple cake and a drink all served with the utmost efficiency. The burser for the flight has an odd English and German accent. He is equally not understandable in both languages. As we approach Köln, the sky suddenly clears, and I am able to see the Rhine stretch from Köln down to Bonn as we make our way down and then back again to land at the airport. We get off. There is passport control! What happened to the EU - ohne Grenzen and all of that. It's quick, however. The gates where we get off look amazingly like Tegel, until I continue on into a huge and modern airport. It's built in the shape of a U, and I need to walk around almost it's entirety before getting to the S Bahn station. It is a huge station and there are exactly two ticket machines for all these people - it takes some time, and the program is running slowly. Lots of frustration on the part of travelers. Finally I get a ticket and the train comes soon after. I know that I am almost there when I spot the good Kaiser riding his horse at Heumarkt, and see the imposing romanesque profile of Groß Sankt Martinus. I am anticipating having a good time looking at all this stuff, but first the hotel. 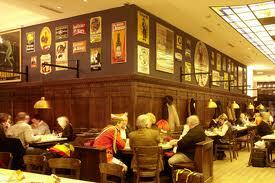 Arthur has recommended this place, the Domstern which is just a couple of blocks from the Hauptbanhof. I make my way there - the reception is friendly, and the room is on the first floor with only an light-well window. Oh well, it will be quiet and dark. Perfect for sleeping, and not much else. I do need some dinner. I walk through the Hbf and come out just north of the Dom. What a sight! After Salisbury this seems to loom with a great deal of size and darkness. Amazing scaffolding surrounds several points of the Dom, with a lot of work being done on the north tower. But this is all for tomorrow. I am hungry and tired, so I go to Gaffen am Dom, where the first question is Kölsch? And the answer better be Ja! That with a Wienerschnitzle and a salad makes for a perfect evening. They also have Vanilla Eis mit Rötegrutze but I will save that for later. I leave this huge beerhall with notions of flopping into my bed. P.S. I just attempted to spell check this, and clicked on the spell check icon. It was a sea of yellow. I am in Germany. My English is "wrong". Please forgive any mis-spellings. I am sleeping fitfully, and happily so - relaxation has begun. There is, however, a sense of being prepared to meet and do for the choir. This I find to be fulfilling and meaningful, but it does require effort and energy. I get up early in order to have a little something to eat prior to liturgy, so I pop into Café Nero and have a toasted sandwich (quite good actually) and a Cafe Americano. In walks one of our younger choir members, so we share a table and I take some time to get to know her better. Her whole life is in front of her and it is a delight to hear her plans and her dreams. She will do quite well, I think. 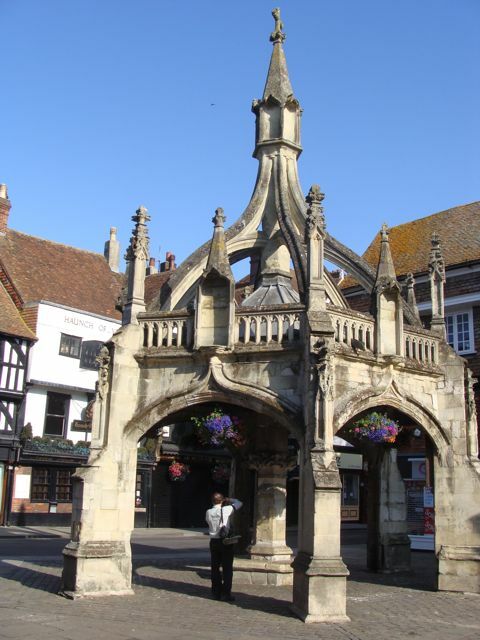 We walk together over to the Cathedral Close. 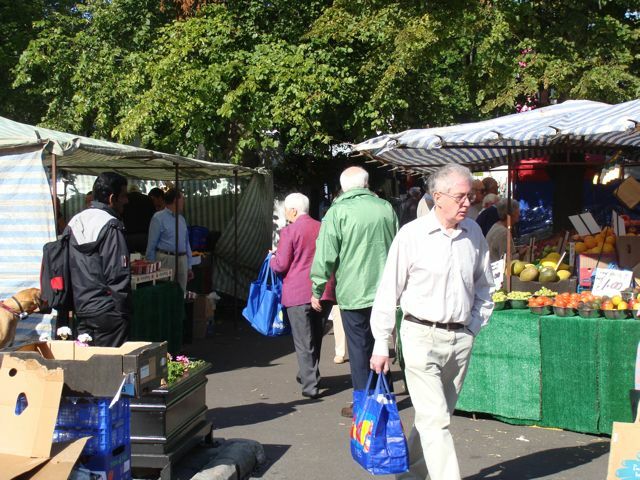 Even at this early hour, the tourists are beginning to wend their way to the close. Gangs of kids from Spain, France, Germany, other parts of England, and the United States. I wonder what they are thinking after listening to my young choir friend. 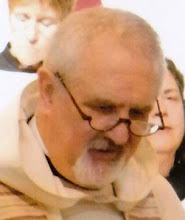 It is to be a Baptism within the Eucharist, and another member of the congregation who is touring but not in the choir and I debate as to where we should sit. 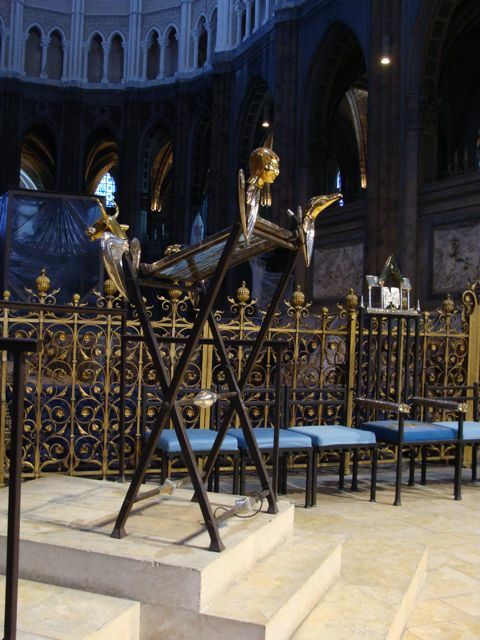 The nave would allow us the opportunity to witness the baptism, and a seat in the quire would allow us to see the ceremonial of the Eucharist. We choose the quire. The baptism is dispersed throughout the Eucharistic liturgy. The Presentation, Renunciations and Chrismation take place at the beginning of the Mass. 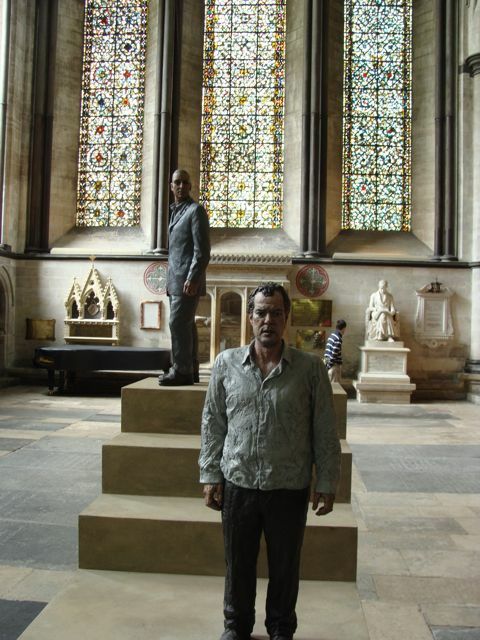 Normally, these rites take place appropriately at the doors of the Cathedral, but today an exception is made. Then follows the Gloria, Collect and the Liturgy of the Word, with the altar party taking seats in the Presbytery. The Gospel is read from the crossing, and the sermon was preached from the pulpit at the edge of the crossing - so this is all happening facing away from us - an interesting orientation for us. 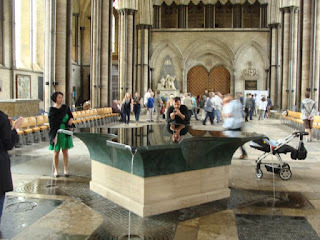 Then there is a procession to the Font, with the congregation asked to join in the gathering. We stay put, but crane our necks to see what is going on. 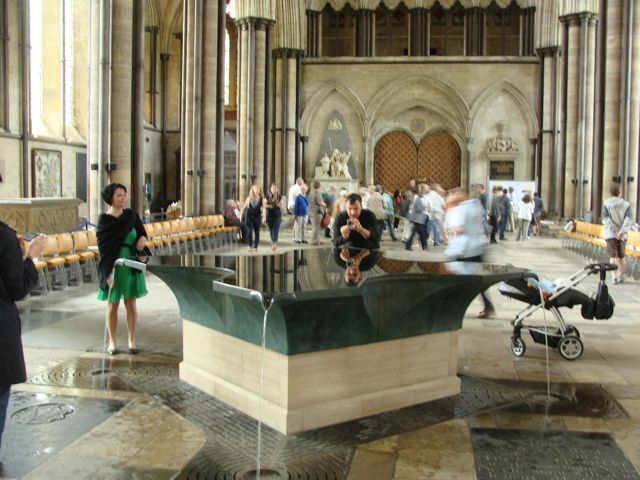 There, at the Font, we have the prayer over the water, the creed, and the actual baptism. At the peace everyone returns to their places. The Eucharist is celebrated and the communion is done, and after the communion we are back at the Baptism. Here it is that the newly baptized are given their candles, and the blessings to all are given along with a sung dismissal. Another interesting note, is that the color for Baptisms (as well as for Confirmation, and Ordination) is red - the color of the Holy Spirit - connecting these Sacraments visually. 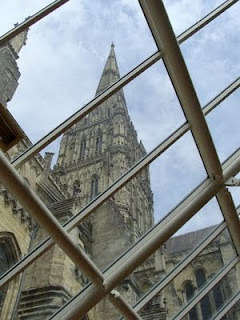 Salisbury has a long nave, and I realized that it would be impossible to intimately see all that was about to happen. 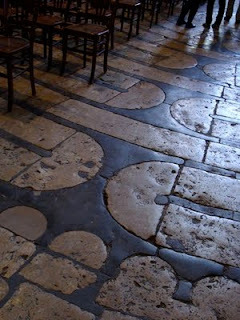 Elements of the liturgy would be on my right, or my left, or right in front of me. Some elements would be unseen, known only by voices and the responses in the bulletin. I began to realize that this is really a more ideal situation for the worshiper, if they are sincere in seeing how life intersects with worship. We have an unreal expectation when we desire to see everything immediately in front of us (and here I am not just talking about liturgy but of life as well). Our culture wants to be immediate and proximate to all that life offers, but that is not possible. Some stuff is both known, and unknown, and yet we become wise from experiencing it. 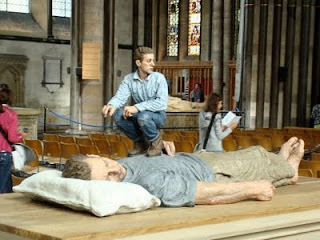 This worship allowed us to experience liturgy/life in a more real way - some elements sharply in focus, and others not. 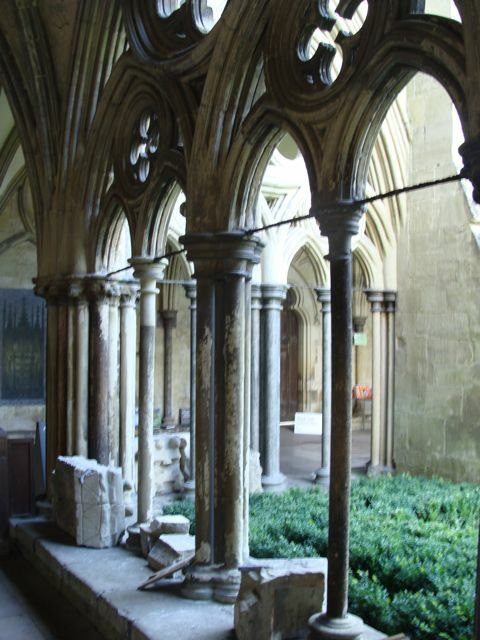 In the cloister many St. Mark's people joined with me as we compared our observations and the knowledge that we had gained. It was palpably electric as we shared ideas. My friend and I go off to lunch. I want to know more about her and her life. She shares fully and asks questions in return. It is, I think, a pastoral moment over stuffed mushrooms, a salad, and a spaghetti carbonara. 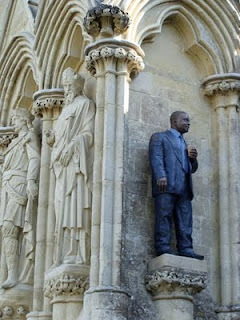 Although on Saturday, I chose not to photograph these sculptures, my experience in the Liturgy compelled me to do so. 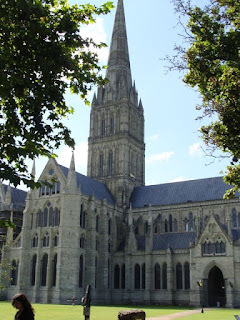 After taking the photographs and purchasing the requisite guide to the cathedral, I went back to the hotel to leave off my camera and rest a bit before returning to the cathedral for Evensong. Returning to the cathedral for Evensong, I sought out my friend and decided to sit with her in our "usual" place in the quire. As I mounted the steps, the verger came over and said, "We'd like you to vest and to read." So I followed her into the Vestry where they gave me a cassock, surplice and magnificent cope to wear (red in anticipation of St. James' Day). The reading was from St. Mark 5:21-43 (Jairus' Daughter, and the Woman with the issue of blood - a rather long reading). I enjoyed proclaiming the reading, since I was asked to do it in the Authorized Version (it's enjoying a 400th Anniversary) so the old English was a bit of a challenge. One of the canons said I had given a "very thoughtful reading" of the text. After the service, there were photos, saying good-bye to the choir as they loaded a bus heading to Truro, their next gig. One choir member asked me to bless them, so I boarded the bus and had a prayer, blessing, and dismissal. I was sad to see them go on. Dinner at Strada (Tomato Basil Salad and a Risotto with Scallops) then home. What a day! I slept well, and luckily the hotel is very quiet. There's no breakfast here, so I have to go out and find some, and end up at Nuggs, a restaurant nestled into a medieval building (1268). Scrambled eggs, with lox, and toast, along with a side of baked beans, seemed to be in order for the morning. Across the street in the square there is a market, and I wander around seeing what the produce looks like. There are lovely strawberries, varieties of apples that I've never heard of, truffles and black truffle oil, gammon steaks (we would call it ham - is this related to the Spanish jamon, or the French jambon? Anna will know, and I shall have to ask her. There's a lot of everything that's offered here: electric cigarettes, underwear, an amazing country pastry place, old books, charities, and you name it. I run into several choir members and enjoy a chat with them. It's time for a coffee or something, so I find a lovely pastry shop for a tarte citron and a macchiato. In my general wanderings I meander into St. Thomas à Becket Church which has the most wonderful hammer-beam ceilings. Women are getting ready for a wedding, putting flowers everywhere and making other preparations. Later, after the wedding is over, changes are rung from the bell-tower for a good hour or so - such is the joy. 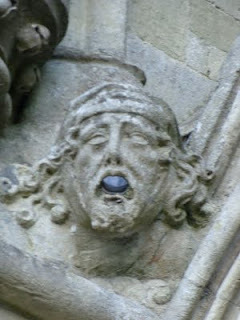 I make my way over to the Cathedral for the purpose of taking some pictures of the stonework. The building is glowing a light ocher in the sunlight, and it is quite beautiful. The limestone of the Western Front in reacting to the rain has dissolved some of the statuary - you can spot the replacements. The ancient stuff, however, is quite nice. In addition, an artist has added some modern polychrome sculpture of ordinary people that both contrasts and links to the ancient portrayals. When I was in Seminary, the school was hoping to build a permanent chapel on the campus. The collect of buildings had been designed by Klauder and Day, the Philadelphia firm responsible for the gothic buildings at Princeton. The seminary was proposing to plop down a modern building by Helmuth, Obata + Kassabaum, a renowned modernist group. Many didn't like the proposed building, but I defended it in an editorial in our campus magazine, Seminar. I reasoned that we needed to have something of our time for our worship. The floor has not been modernized there, the chairs scrapping over the ancient labyrinth, and the sidewalls in the ambulatory untouched. There have been additions, but they seem to be relegated to furniture and stuff. At Salisbury, there is a feeling of openness to what ever time had to offer, while Chartres seems more circumspect and pristine. Perhaps it is because of the liturgical conservatism that is inherent in the Roman Catholicism of Chartres, as opposed to a more experimental usage (the Elizabethan reforms, the Puritans, the repristinations and recovery of Sarum usage, and the Victorian and Oxford Movement aesthetics) in Anglicanism. Which did I like more? - hard to say - each is unique and that is, I think, the blessing. Lunch at the Red Lion was a "jacket potato" (baked potato with a salad and a dressing for the potato of "Greenland prawns" and a mildly spicy "rose sauce." 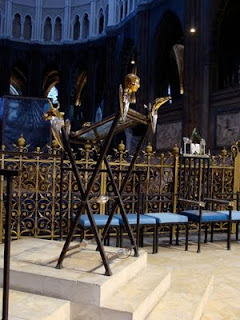 A nap seemed ripe before I went back to the cathedral for Evensong, where I was privileged to read the First Lesson (I Kings 3:5-12 - Solomon's dream and prayer). The choir sang marvelously, and we all chatted after at supper and later at a pub, where our table talked theology and culture. It was a wonderful day. It is a bittersweet day. I'm excited about my travel to England, but my heart is in my throat about Anna leaving for Kansas. Thus we have arranged for a last breakfast at the diner nearby (a favorite of hers). The conversation, however, isn't a usual good-bye conversation, but rather the usual attempt to try and figure ourselves and our family out, including all the laughs and sighs that that usually involves. She is also picking up some furniture that we have stored for her, and then she will head down to my sister Bonnie's to pick up Grandma Terrass' rocker. How odd that it will travel back to a place about 24 miles from whence it originally came. Anna drops me off, and there are tears - but that was to be expected. I look back and she is gone. What a wonderful decade of togetherness it has been. I check in, and it's between flights in that section of the terminal, so security is a breeze. What to do with the time? Walk. Iced Tea. Wait in the lounge, but not for long - they load the plane an hour in advance. I'm seated next to a very handsome African-American woman, a performer. I watch as she memorizes lyrics and I'm fascinated. The meal is mediocre, but what am I expecting? I sleep on and off, and my window gazing is curtailed by a very bossy family in the center section who keep grousing about the light, and then keep everyone around them awake playing games with their daughter. Misanthropy! We are early into London, at least 45 minutes early. There's a bit of a line at passport control, but soon I've picked up my luggage, purchased an express train ticket, and am on my way to Paddington Station. Once there I swipe my Oyster card, and am delighted to find that I have 30p left on it. I load it up with a few pounds, making my way on the Tube a little less troublesome. I head for the Bakerloo line, and am soon at Waterloo with a bunch of time on my hands. My train to Salisbury isn't until 12:20. I have breakfast, but avoid the Black Pudding. Then I realize I can check my luggage and walk around a bit. I decide to walk over to the London Eye and see if I could do that, but the lines are overly long. The Hungerford and Jubilee Bridges, however beacon, so I take a long walk. In the midst of the Jubilee Bridge I realize that I could have quickly gotten over to Tate Britain and popped into their Victorian Rooms, but I wasn't thinking ahead, and now the time was too short. 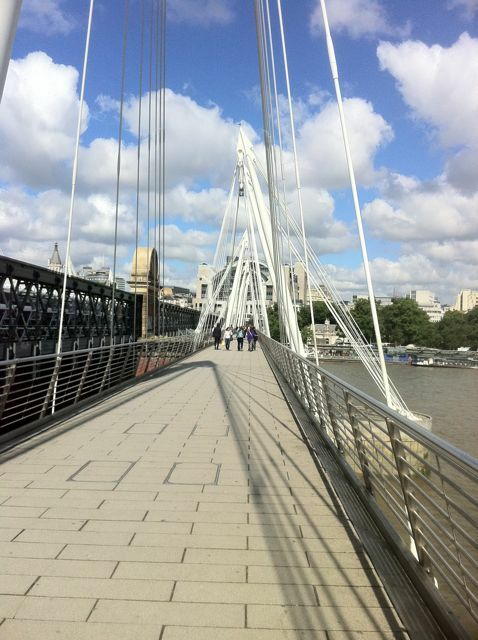 The walk along the bridge, which is a stunning piece of engineering, and the sights along the Embankment, are food enough. 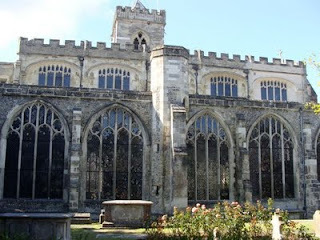 I do visit one Church, St. John's, built by an architect unknown to me, and badly damaged during the blitz. It was rather cheaply restored in the 50s, but I take some time, enjoy the paintings and rest. I had just finished a counseling session with a troubled individual and it was well past the lunch hour. As I thought about where to go to lunch, someplace quiet, where I could rest and hide for a minute or two. I decided that I needed to take a long walk and fine something different. I walked down to Oxford Street, and then continued north to Center Street. It was there that I would make a search for something new and different. 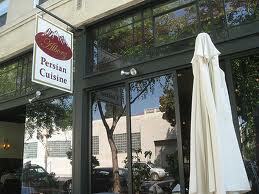 I did find a restaurant, Al Borz, a wonderful Persian restaurant that I shall visit again (Lamb shank with tomato broth, garbanzo and white beans, and fresh mint, cilantro [which I quickly discarded - tastes like soap] and basil - all very good. This, however, is not the story. As I rounded the corner onto Center, I noticed two ACLU volunteers replete with clip boards, bright blue T shirts, and broad smiles. 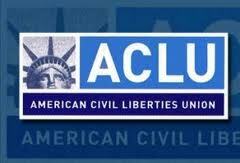 I heard the first say, "blah, blah, blah, gay and lesbian rights..." which caught my attention. As I moved on I caught the eye of the second volunteer. She looked at me, slightly opened her mouth, gulped, and then averted her gaze. I continued on, and then stopped, turned, and walked back to her. She looked at me as I asked, "Were you afraid to talk to me?" "Yes", she replied, "I just got reamed out by a preacher, who told me I was doing wrong." We looked at each other for a second, and then I said, "I'm sorry about that. I'm a gay man and a priest, and I really appreciate what you are doing here." She dissolved into one of the biggest and broadest smiles I have ever seen. She had been shaken up by the preacher man. "It wasn't very Christian," I said, and she agreed. They were not asking for signatures but for money, so I gave a little donation. 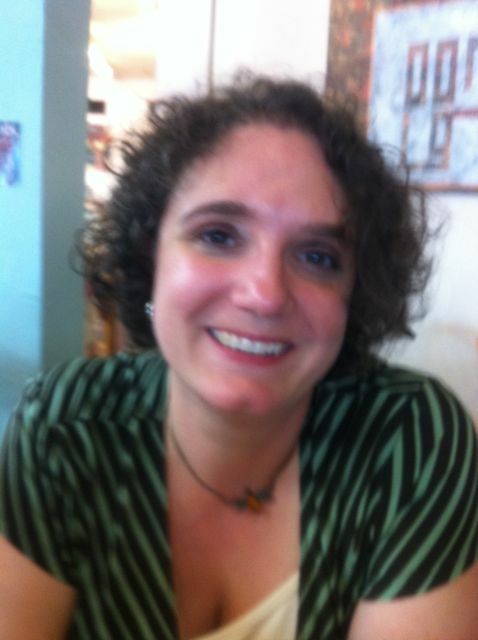 When I returned to see her, after lunch, we talked more about what she was doing, and I invited her to Saint Mark's. "Be set for a surprise," I said, "not all churches are like what you have just experienced." I asked her for her name, and she had remembered mine. I thanked for the great work that she was doing, and as I left I turned to look to see that big, bright smile - her gift to me. The Streets of Berkeley - Some weeks ago.